read. watch. listen. : What do you think? Want to tell the politicians that represent you what you think about the issues that affect you? Here's your chance. 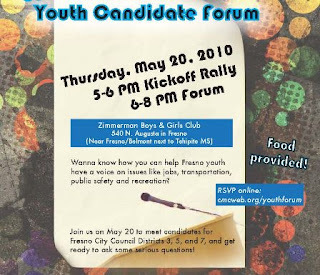 Tomorrow night (Thursday the 20th), head over to Zimmerman Boys & Girls Club in Fresno. In addition to the free food, candidates for City Council Districts 3, 5, and 7 will listen as youth share their realities of today's world. The kickoff rally is at 5 and the forum starts at 6. Everything is FREE!